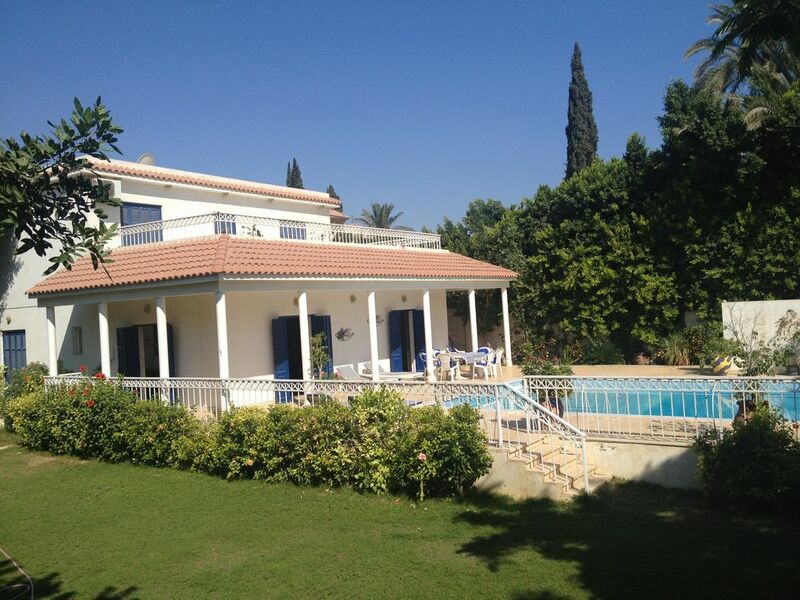 This is a luxury four bedroomed villa, with a secluded swimming pool. This villa is situated about 5 minutes walk away from Villa Sahara and is situated 30 minutes outside Alexandria in a delightful village called King Mariout where you will see donkey and carts and traditionally dressed Bedouin. This superb location enables you to not only see the sites of Egypt but also experience the local life. The Pyramids are only 2 hours drive away and you can also visit the Greco Roman sites of Alexandria, the war memorials of El Alamein, the colourful souks, the beautiful beaches along the North Coast, and you can even sand board down dunes. It is a holiday suitable for everyone. We built and designed both Villa Sahara and Villa Oasis. Villa Sahara being the first one and Villa Oasis 3 years later. We are moving back to the UK this summer as our son Jake needs to start his A level courses here, and we will have Asrar our housekeeper looking after you ensuring everything runs smoothly. We will also have smart televisions so that you can skype us should the need arrive. We have a strong team behind us - not only Asrar, but also Sayeed our Boab (doorman/gardener), and hassan who manages the maintenance of the villa's for us. Zed manages the transport. The properties are luxurious and fully equipped. We pride ourselves in them being well maintained and also giving you a fully personal service to ensure that your holiday runs smoothly. Having lived in Egypt for 12 years, with our children growing up here we have grown to love everything about Egypt and it's people. The Villa's are situated in a village that enable you to feel that you are really living in Egypt and not some sterile hotel, though you have the benefit of shutting the gate and being in your own peaceful enclave when the hustle and bustle of Egyptian life gets too much! Spices available. Welcome pack provided if you book for more than a week. CD player and also a speaker for an ipod available. A variety is available for various ages. Can play at the Adham Hotel and the King's ranch hotel nearby. Golf courses are in Sporting Club, and also along the North coast. Please smoke outside if possible or in the living areas - not in the bedrooms. As usual we always enjoy our time there. Really enjoyed our time at villa oasis, especially with kids, the villa was perfect. The villa provided a range of entertainment from TV, dvds, books and even Lego. Everything was in good condition and would definitely recommend it to family and friends. Thank you - I am so pleased you enjoyed your stay st our villa. Thank you so much for taking the time to write us a review. We are so pleased you enjoyed your stay at Villa Oasis. It means a lot to us. We had a fantastic holiday. The property is superb. Well maintained. Would recommend it to anyone. I really enjoyed the place specially the privacy. Very close mosque and supermarkets. Everything I needed was in the villa like TV, DVD, and music speaker...etc. The pool was great. Maria responses very quickly and she is very helpful. Also, the house manager Asrar was helpful as well. I enjoyed my time and definitely will go again. It really means a lot to me, to know that you enjoyed your stay at Villa Oasis. We look forward to having you back. King Mariout itself has many food stalls where you can buy all basic food supplies. There is a large Carrefore Hypermarket 20 minutes away where you can buy everything. There are quite a few restaurants in the King Mariout location and a wide choice if you go a little further a field. Visit the many Greco Roman sites in Alexandria; the catacombs, pompeii's pillar, Roman theatre and the villa of the birds, Fort Quaitbey, the Alexandrian Museums, the library, the beautiful gardens and Palace of Montaza. It's only 2 hours from the villa to the Pyramids. Take a trip to the Western Desert for the day or visit the war memorials of El Alamein. Don't worry about having to find all these places or driving in Egypt, we can organise a car and driver for you, at a very reasonable rate. When you feel the need to take a break from the hustle and bustle of the busy Egyptian streets, relax by the pool in total seclusion, overlooking the tropical garden. Transport and airport transfers can be arranged for an additional charge. We include in the price daily cleaning if you book for more than three nights, and a welcome pack for week bookings or more. If you book for two weeks or more we include the airport transfer in the price.